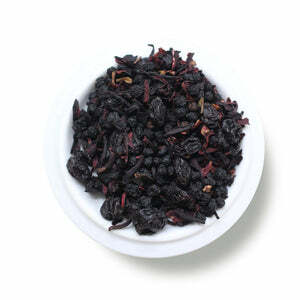 Ingredients: Organic elderberry, organic currants, organic rose hips, organic hibiscus. This has long been a favorite of ours, and we continue to enjoy it's deep dark fruity notes. 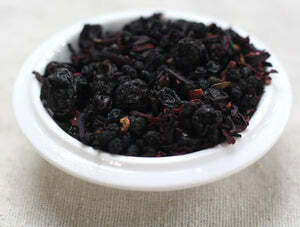 Elderberry has long been touted for it's cold fighting abilities. Although it's powerful, it adds a punchy tart note to this sip, along with currants rose hips and hibiscus. If you want to wake up your tastebuds, you'll enjoy this tea! Mug (8oz water): 2 level tsp • 200º • Steep for 6 min. Teapot (8oz water): 2 level tsp • 200º • Steep for 5 min. I have made three pitchers of this tea in iced form and Love It! The color is brilliant and it's delicious without sweeteners added, just perfect to make me feel healthier and happier sip by sip. The package was received in a timely manner. The tea tastes amazing and is super fresh! We also love getting samples with our package, so yummy! Thanks!